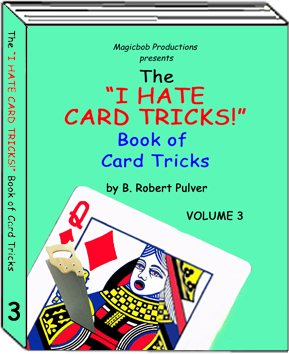 The "I Hate Card Tricks"
You STILL hate card tricks?!?!? 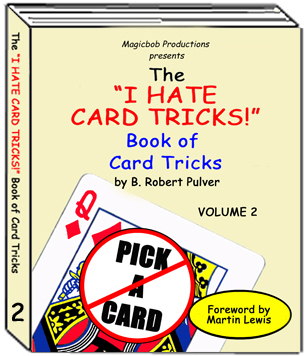 Here, in volume two, I present an all new collection of miniature "stage illusion" recreations made popular in the original "I Hate Card Tricks". "[Bob] is Nick Trost with an Exacto knife." 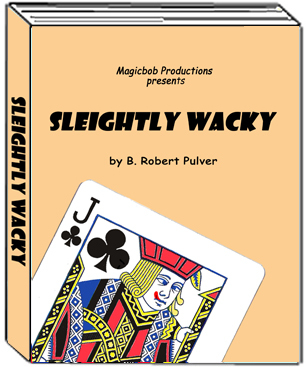 "...will absolutely fry a lay audience as well as many magicians." Includes all 10 effects listed below plus the guide to printing your own custom cards. Click on the pictures or the INFO buttons for a brief description of the effect. Please note: There are no refunds on magical secrets. Once you learn the secret, you cannot unlearn it, so you can't request a refund. This effect was inspired by Jim Steinmeyer's "Origami" illusion. A signed Queen is placed into an envelope. The envelope is folded into a small packet. When it is unfolded, the signed Queen is removed completely intact. It has not been folded. 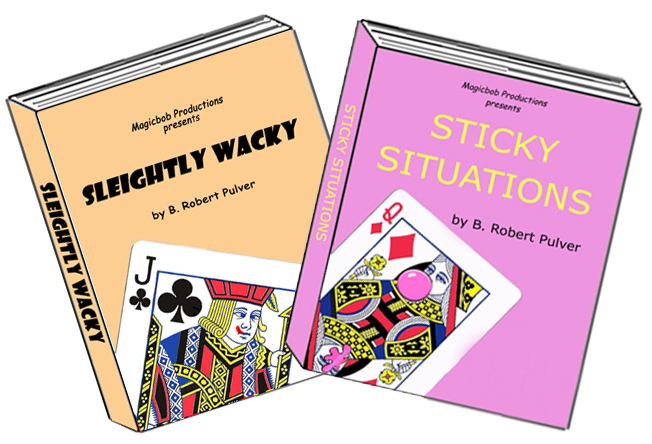 Bonus Effect: Split Personality - a traditional "Sawing a Woman in Half" presentation (using props from "The Origami Queen"), is also included. 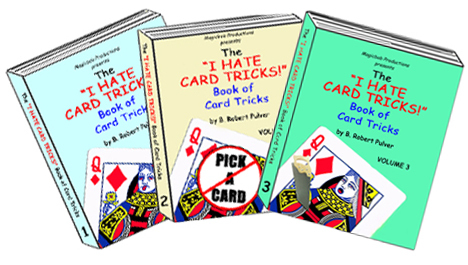 An Ace is signed across the face and placed between two Jokers. The packet is set on the table. Two more Jokers are shown. One has a window in it, through which the other can be seen. 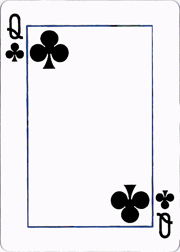 The signed Ace disappears from between the two first two Jokers and reappears visually between the second pair of Jokers. Can be performed using any card, not just an Ace. A two-phase routine (either can be performed independently). 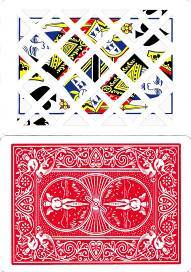 In the first phase, a playing card guillotine is used on a spectator's finger. 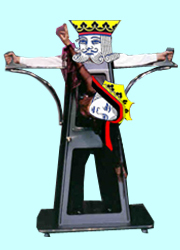 In the second phase, a Queen is placed into the guillotine. After the blade drops, the Queen is removed. She has literally lost her head! Includes multiple options for cards printed with head chopped off or actually have the head cut out of the card. 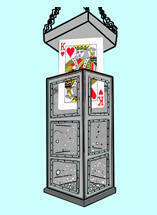 A signed King is placed openly and cleanly into a playing card "cage." 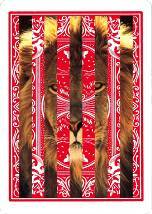 The front and back of the King can be seen through the bars on either side. with no cover, the King visually transforms into a lion! The lion card is openly and cleanly removed from the "cage" and handed immediately to the spectator to verify that his signature is on the back of the card! This effect is based on the stage illusion, "Geometrick." 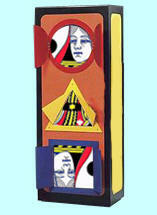 A Queen is placed in a playing card "cabinet." Geometric-shaped tubes (square, triangle, and circle) are pushed through the cabinet. The audience can see all the way through the tubes! The tubes are removed. The Queen is removed from the cabinet and shown to be whole. 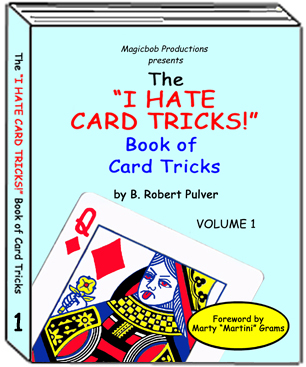 This effect is based on Robert Harbin's Bow Sawing illusion. 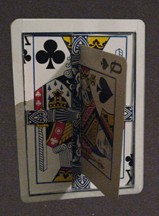 A Jack is shown and placed into playing card stocks. A miniature bow saw is used to saw through the card. The stocks are removed, revealing that the saw now completely surrounds the card. 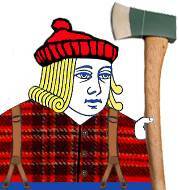 Includes design for optional custom printed "lumberjack" card. 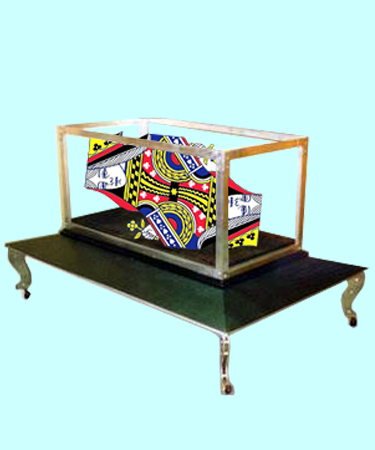 This effect was inspired by the Crystal Casket illusion by William E. Robinson, better known as Chung Ling Soo. A blank card is signed by the spectator and sealed in a clear plastic box. The box remains in full view at all times. A Queen is then shown and placed in the spectators hands. 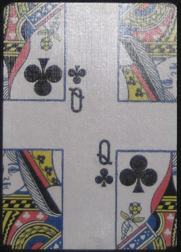 When the spectator opens his hands, the border and indices of the card are still there, but the image of the Queen has vanished. The box is opened to reveal that the missing printing is now on the previously blank signed card. 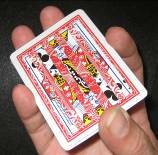 The King of Hearts reenacts this death-defying escape made famous by Houdini. The King is locked into the cell and placed underwater. The spectator verifies that the King is securely shackled. Yet, he escapes effortlessly right before the spectators eyes. The spectator handles all the props before and after the effect. You can even let them take the whole thing home as a souvenir! This effect is based on the "Cargo Net" (also known as the "Bengal Net") illusion. 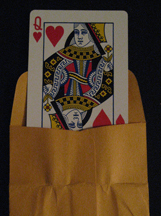 A signed Queen is placed into a playing card "net." The net drops open and it is empty. The Queen has vanished! The deck is spread on the table. All the cards are face-down except for one card in the middle of the deck. The face-up card is the signed Queen! 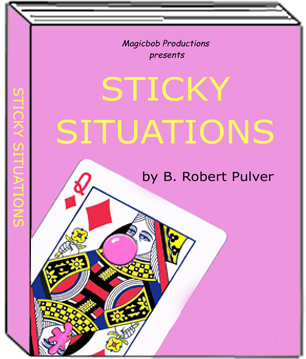 This effect was inspired by Jim Steinmeyer's "Interlude" illusion. 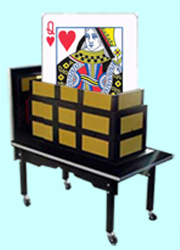 A signed King is placed into a playing card "cabinet." The Queen passes directly through the King. Both cards (as well as the "cabinet") can be examined before and after the effect. Many of the effects I’ve published recently require custom-made gaff cards. I’ve been experimenting with a number of techniques to make high quality custom cards at home. The steps outlined in this article will allow you to create custom cards (using your home computer and ink jet printer) that match the look and feel of a standard playing card quite nicely. This article is provided FREE with the purchase of any of my effects that requires a custom printed card. with purchase of any effect that requires a custom printed card. Disclaimer: Many of these effects require custom-printed gaff cards. 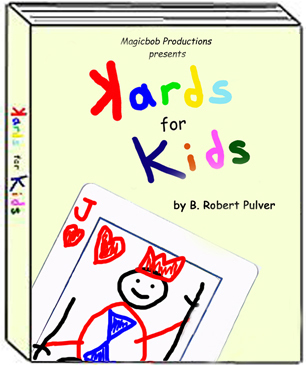 Instructions are provided for making your own in each book or e-book. 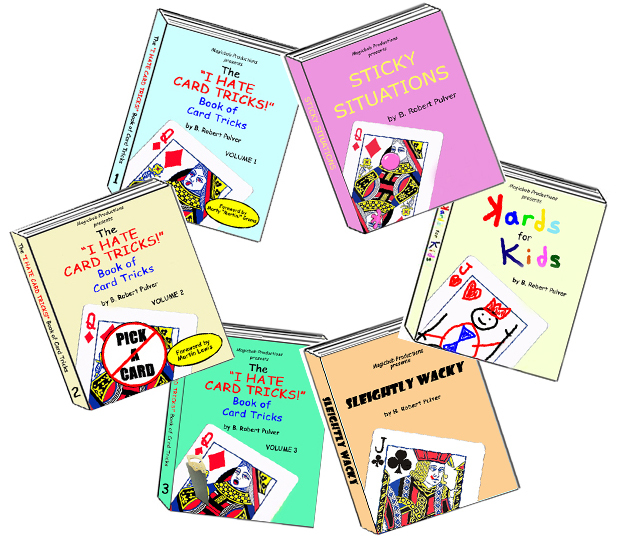 However, knowledge of and experience in card-splitting and/or other techniques for creating/printing custom-made gaff cards are recommended.